Eating right and exercising right is the best way to maintain a fit body and live a healthy lifestyle. But doing that is easier said than done. Because no day is ever the same. There are days when we eat a balanced diet but do absolutely no exercise. And there are days when we overeat and forget to exercise. 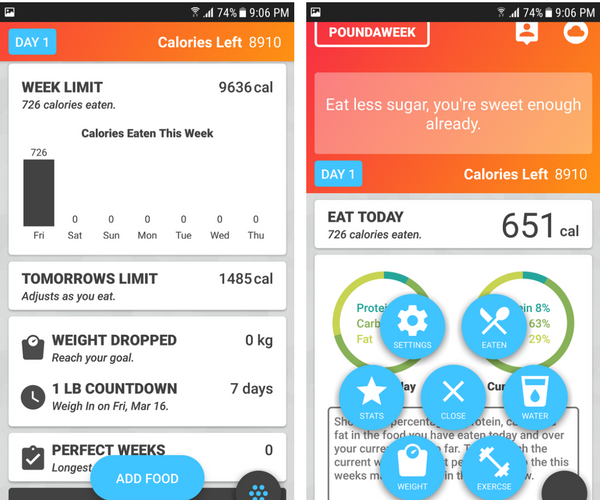 Poundaweek is a smart calorie counter app that helps you stay on track with your weight oriented goals without pressurizing you. We take a closer look at how Poundaweek can help you lose all those extra pounds in your body..one pound at a time. Maintaining an ideal weight is something we all aspire for. Some of us need to lose weight, some of us have to gain weight and some of us need only to maintain our current weight. Whatever our weight goals are, a good calorie counter app on our smartphone makes it easy to maintain those goals. Poundaweek is designed to help us achieve those objectives. The app does this by letting you know exactly how much to eat and automatically adjusts for the calories you burn. Once you download the app, you have to input some basic details such as your age, gender, height and body type. Next, you set your weight goals. In my case, it was to lose 5 pounds. Then you enter your current weight and you’re all set. 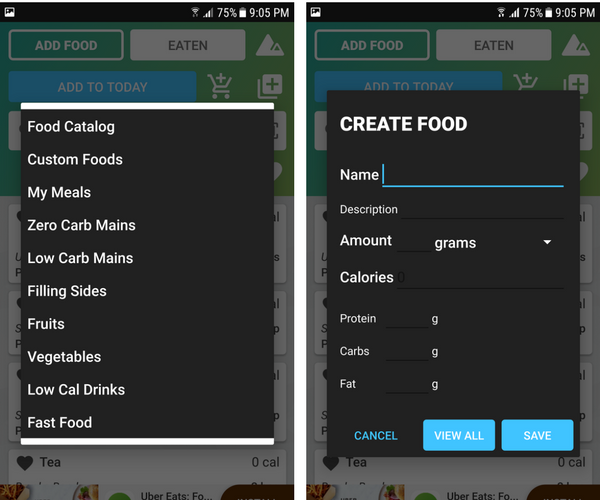 Once you’ve submitted the requisite information, the app will let you know how much calories you can eat everyday. Your only work after this is to add all your meals via the Add Food Button. Foods can be added by typing in keywords and selecting an option from the Search results. But since everyone eats differently, the app lets you snap a picture of the meal to add to the app. The smart AI will do the meal addition work for you. For users who cook their own meals, there’s an option (in the Food Catalog) to create and save your custom meals. As you record your meals, the calorie counter will start displaying all the statistics for you in attractive formats. A pie chart displays the percentage of protein, carbs and fat in your food. You can see a comparison of what you ate today as against what you ate in the current week. According to your first day’s consumption, the app sets the consumption limit for the next day and the next week. This is done by automatically adjusting against your everyday consumption. So if you indulged a little more at a friend’s birthday party, you can offset that by consuming less calories the next day. Simply put, if you had a bad day with your weight loss goal, Poundaweek will adjust your target for the week so that you still feel encouraged to keep working on your goals. Apart from tracking your meals, the app also gives you a Water Consumption target to follow and track. If you have an account with Google Fit, the app will automatically track your exercises and determine how many calories you burned off. If you don’t have a Google Fit account, you can enter your calories burned data manually. Why You Should Download Poundaweek? Poundaweek is one of those calorie counter apps that feels very flexible and easy to use. One of the things that I like is that it doesn’t overwhelm you with too much information in its database. You can add your own custom meals and even get low calorie meal recommendations, if you need a bit of inspiration. The simple bar and pie charts give you a nice visual view of your goal progress. The best part is that your targets are set for weekly revision. This puts less pressure on you to maintain your diet everyday. Often, apps throw in account set up pages and a bunch of tutorials screens that puts you off even before you get started. Poundaweek is NOT one of those apps. You don’t have to create an account or fill in a ton of information before you can get going. 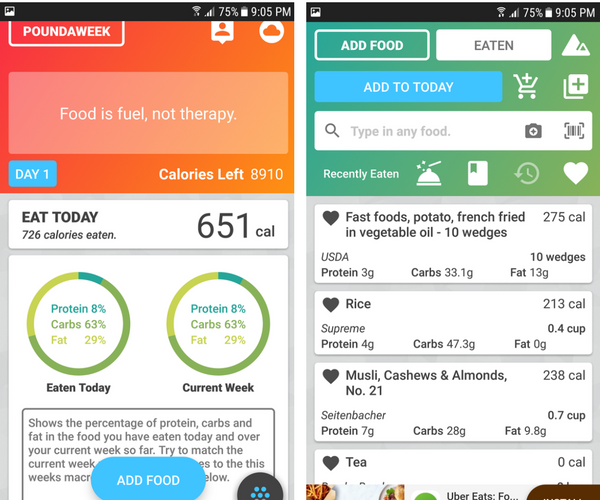 In just a few taps, you can be on your way to managing your weight loss goals. Lastly, I find Poundaweek really comfortable and comforting to use. I haven’t been able to stick with most calorie counters because I find them too overwhelming to use. Poundaweek keeps it simple and flexible enough to encourage me to keep taking those small steps to keep my weight in check. If you haven’t tried Poundaweek yet, click the link below to check it out. If you are using or have used Poundaweek, let me know what you think of the app.